The Remote Storage step of the wizard is available if you have chosen to restore data from a backup file that resides in a remote location — in a network shared folder, on a backup repository or a cloud repository. Shared folder — select this option if the backup file is located in a network shared folder. With this option selected, you will pass to the Shared Folder step of the wizard. 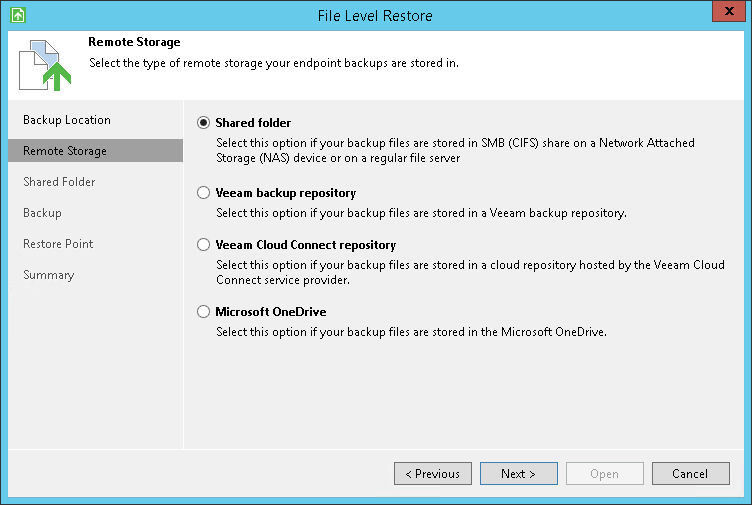 Veeam backup repository — select this option if the backup file resides on a backup repository managed by the Veeam backup server. With this option selected, you will pass to the Backup Server step of the wizard. Veeam Cloud Connect repository — select this option if the backup file resides on a cloud repository exposed to you by a Veeam Cloud Connect service provider. With this option selected, you will pass to the Service Provider step of the wizard. Microsoft OneDrive — select this option if the backup file resides in the Microsoft OneDrive cloud storage. With this option selected, you will pass to the Microsoft OneDrive step of the wizard. The Microsoft OneDrive option is not available if the Veeam Agent computer runs a Microsoft Windows Server OS.